While completing two interdisciplinary degrees combining Ethnomusicology, Anthropology and Media Arts at the University of Arizona, I’ve had the opportunity to conduct scholarly research on a variety of topics at both the undergraduate and graduate level. Below is a sampling of the research papers which have grown out of this work. Feel free to provide feedback and added perspective on what I’ve written here. I’m always seeking ways to extend and expand upon my research interests, and am seeking research partners for new collaborative research. Contact me with ideas if you’d like to partner on such a project, or if you’re exploring a research direction which might intersect with any of these. 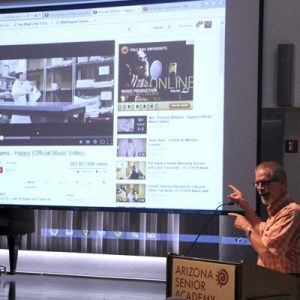 Master’s Thesis in Musicology/ Ethnomusicology at the University of Arizona consisted of both a 33-minute documentary film and a more traditional thesis document. The Zoom Record Thesis tells the story of Zoom Records in the context of the burgeoning popular music scene of the late 1950’s and all that it included – culturally, artistically and technologically. Do you have anything to add to the story? If so, contact me. While enrolled in the Graduate Seminar in Ethnomusicology at the University of Arizona School of Music, I spent an entire semester conducting detailed secondary research into the rhythmic and social qualities of African music, in preparation for a six-week field study research experience in West Africa. I’d enjoy hearing your feedback and contributions to this study, particularly if you have travelled to Africa or know other sources of good research on this topic. Another product of my research into African music is this 12-page annotated bibliography, which can serve as a valuable research tool for others who are curious about, or are formally investigating, African music. Know of other sources to add to my bibliography? Please post your comment. As a documentarian of musical material, I’m concerned with how the filmmaker can best serve the needs of his audience to best absorb and comprehend the musical material that’s presented. 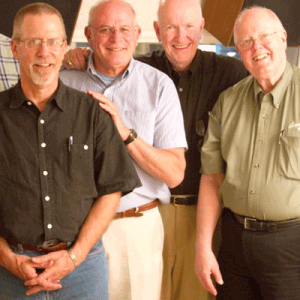 This is the text of a presentation made at a joint conference of Musicologists, Music Theorists and Ethnomusicologists, in Boulder, CO in 2009. I’d love to hear from other filmmakers and ethnomusicologists who have ideas to contribute to this study. 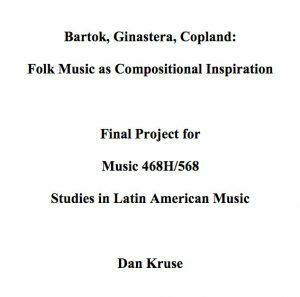 As part of a graduate seminar on Latin American Music, I became fascinated with the practice of many great composers to draw upon the folks music idioms of their respective cultures as source material for their orchestral and chamber compositions. These three composers are exemplars of this approach to composition; what’s more, their resulting works show remarkable similarities to one another! 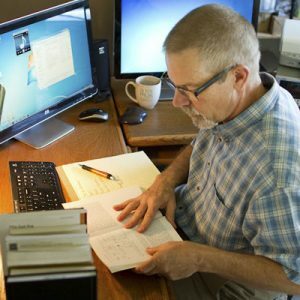 I’d love to hear your reflections to this line of research. 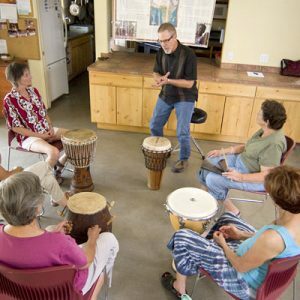 A paper I wrote, Witnessing a Cross-Cultural Connection for a University of Arizona World Music class was inspired by my noticing the remarkable similarities between two musical performances, a half a world apart from one another: a West African troupe performing in a unique manner combining rhythmic chanting, dancing and whistling …and a group of African-American “Steppers” in Tucson. My reflections and preliminary research into the potential connections between the two are outlined here. Tell me your impressions or insights about these genres of music and dance, and whether you know any more about them!